4 layer soft gathered net. Gathered net skirt (six layers 12" long reducing with size). Tiger mesh/black Lycra halter neck leotard. (layers and length reducing with size). Demisha tutu has a nylon bodice with two velvet panels in the front, the right shoulder strap is of a clear plastic material whilst that on the left and the top edge of the bodice is finished with a ribbon of silk flowers. The tutu has eight layers of gathered net approx. 11 inches (28cm) wide reducing to seven layers and 10 inches (25cm) wide at size C1, and a full length zip fastener at the back. Halter neck (tied at back). Frilly 4 layer gathered net tutu skirt. Eight layers of gathered net 12" (30cm) long (reducing in proportion to size). Neckline, bodice and top layer of net decorated with tiny butterflys and flower trimmings. Golia Tutu has a white nylon v-front bodice with zip fastening at the back, the front centre panel overlayed in lace, spaghetti straps and seven layers of gathered net approx. 11 inches (28cm) wide reducing to 10 inches (25cm) at size C1. The tutu skirt is also overlayed with lace gathered at the edges and has a fan shape gathering with a rose at the centre. 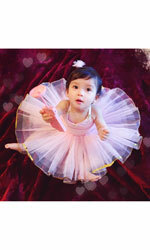 Sweetheart Tutu has a gathered front with spaghetti straps which tie at the back of the neck, making it easy to slip on and off, a scooped back nylon Lycra bodice with four front panels and an attached tutu skirt with 5 - 6 layers of gathered net. Tutu skirt has nylon pantie attached. 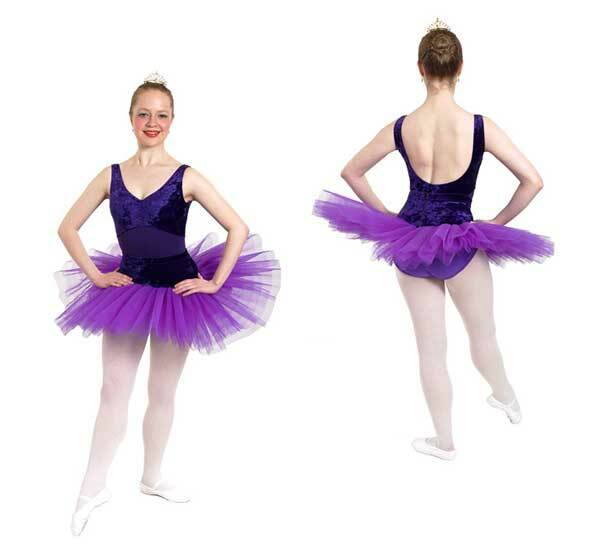 Sweetheart Tutu has a gathered front with spaghetti straps which tie at the back of the neck, making it easy to slip on and off, a scooped back nylon Lycra bodice with four front panels, back zip and an attached tutu skirt with 5 - 6 layers of gathered net. Tutu skirt has nylon pantie attached. Top layer white others sky blue. Sky blue lace overlay on bodice. Pair of lace arm puffs. Attached calf length gathered net v-waist skirt (three layers). Bodice and waist trimmed with stretched gold satin binding. Sapphire Tutu is a stretch nylon Lycra leotard with a chiffon cowl neck drape attached back and front, it has a zip fastener at the back and a seven layer gathered net skirt approx. 12 inches (30cm) long. Layers of net reducing with size. 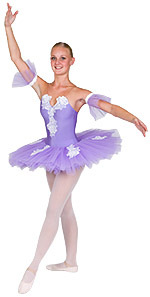 Lelia tutu has a nylon Lycra leotard with the bodice overlaid with stretch lace, a tutu skirt of gathered net (eight layers), zip fastening at the back, a gathered roll waistband and butterfly sleeves in chiffon. Length of skirt and number of layers reduces with size. Attached skirt, nine layers of gathered net approx. 12 inches (30cm) long. Skirt length and layers reducing with size. Attached calf length gathered net skirt (three layers). Romantic tutu with spaghetti straps, in nylon Lycra, decorated with lace on the upper bodice and on the calf length gathered net skirt (three layers). Forest green nylon Lycra Leotard. Bodice made up of four panels separated by red piping. Double shoulder straps in red and green, decorated with red roses. Attached tutu skirt: six layers of white gathered net approx. 12 inches (30cm) long at size C3 reducing to approx. 10 inches (25cm) at size C00, overlaid with a layer of forest green net with a silver hologram trim and a wide red satin border . 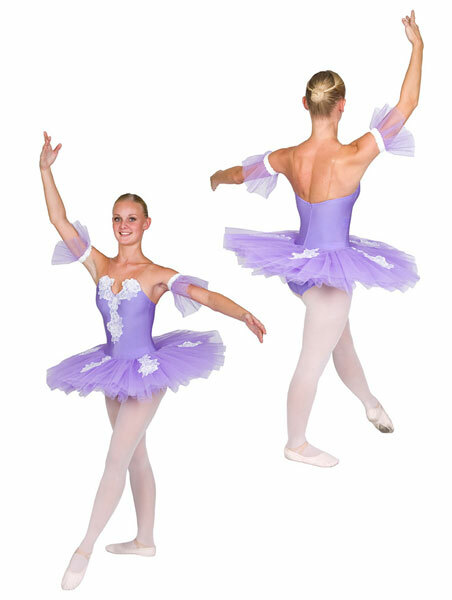 Christmas tutu is a sleeveless nylon Lycra leotard with zip fastening at the back, a halter neckline and an attached tutu skirt. The tutu skirt has six layers of gathered net approx. 12 inches (30cm) long at size C3 reducing to approx. 10 inches (25cm) at size C00. The halter neckline, top of the bodice and edge of the top layer of the tutu skirt are decorated with a trim of red roses backed by green leaves. Leotard with attached tutu skirt. 3 gold butterflies on front neckline. Pink gathered net (four layers). Net edged with gold trim. Nylon Lycra headband with gold butterfly. 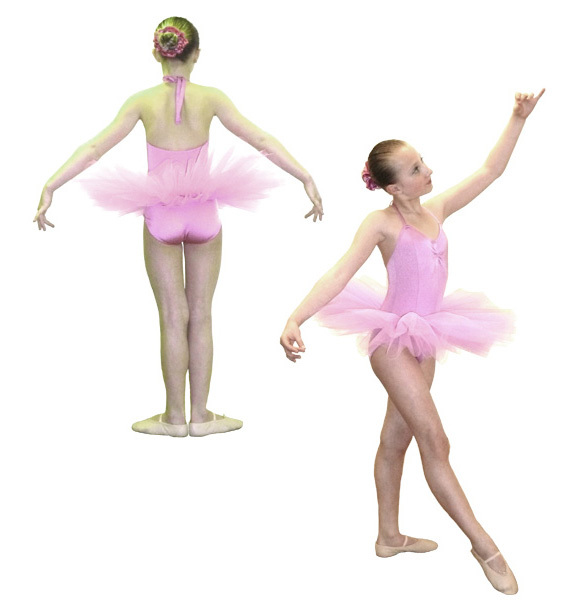 Girls dance tutus are made to order in accordance with the size charts on this page.